Policy Exchange is a neoconservative orientated think-tank with close ties to UK Prime Minister David Cameron. It was launched in April 2002 by two former Asda executives Francis Maude and Archie Norman with Nicholas Boles as its founding director. It is part of the Stockholm Network  a working group of European market-oriented think-tanks. The logos for 'XChange', as Policy Exchange was originally branded in 2001, and the affiliated group Conservatives for Change or 'CChange'. The two were presumably kept separate to allow Policy Exchange to apply for charitable status as a non-partisan organisation. The table on the right displays information on the current and former directors of Policy Exchange Ltd as registered with Companies House on 3 January 2010. Policy Exchange is both a charity and a company limited by guarantee (i.e. without shareholders), meaning that these directors are also the trustees of the charity. The 14 current directors (i.e. those where no resignation date is provided) are displayed first in alphabetical order, followed by the company’s former directors. Those trustees who are not drawn from the world of business or finance are all affiliated to Britain’s conservative press. Virginia Fraser is the widow of Frank Johnson,  a former deputy editor of the The Sunday Telegraph (1995-99) and editor of The Spectator. Alice Thomson is a comment writer at The Times and a former associate editor of the Daily Telegraph  and Charles Moore, Policy Exchange’s Chairman, is a former editor of the Daily Telegraph, Sunday Telegraph, and The Spectator. Policy Exchange’s first director was Nick Boles, a former member of Westminster City Council considered part of the ‘Notting Hill Set’ – an informal group of young Conservatives connected to the Prime Minister David Cameron. Before joining Westminster Council Boles ran a DIY business, prior to which he 'worked for a few years in Germany, Russia and Eastern Europe, helping state-owned industries prepare for private ownership.' Boles is a former flatmate of Michael Gove  who was Chairman of Policy Exchange whilst Boles was director. Both men are signatories to the statement of principles of the Henry Jackson Society Project for Democratic Geopolitics, a British neoconservative organisation. Policy Exchange's third director Neil O'Brien (left) with his predecessor Anthony Browne (right). Photograph by Teri Pengilley from guardian.co.uk. In 2012, it was announced that O'Brien would be leaving Policy Exchange to start work with George Osborne, advising him across the political landscape with a particular focus on how to reach voters in the north of England. In January 2013, O’Brien was replaced by Dean Godson, the former Head of Security Unit. Mark MacGregor - deputy director, April 2013. Formerly chief executive Conservative Campaign Headquarters under Iain Duncan Smith, managed the London Mayoral campaign for Steven Norris in 2004, and has been CEO of Connect Support Services (founded by ex-Policy Exchange director Adam Afriyie) from 2007. Nick Faith - director of communications, March 2011. Formerly associate director at Luther Pendragon from May 2005 to March 2011. Piechart showing the relative prominence of Policy Exchange’s Research Areas between 2003 and 2010. Policy Exchange states that it is ‘particularly interested in free market and localist solutions to public policy questions’. Like other right-wing think-tanks much of its research advocates the expansion of private power through the promotion of 'free market' policies. In the case of Policy Exchange however, these measures tend to be presented as progressive solutions to social problems, something it describes as 'Using centre-right means to progressive ends'. It divides its research into nine categories: Arts & Culture, Crime & Justice, Economics, Education, Environment & Energy, Foreign Policy & Security, Government & Philosophy, Health and Social Policy. The pie chart on the right displays the total number of events and publications listed in each policy area up to 31 December 2010. The same data is displayed in the table below, which shows the growth in the total number of events and publications as well as the relative prominence of each research area year on year. Chart showing the relative prominence of Policy Exchange’s Research Areas year on year between 2003 and 2010. Policy Exchange's 2006 pamphlet ‘When Progressives Treat with Reactionaries’ written by the then New Statesman journalist Martin Bright. 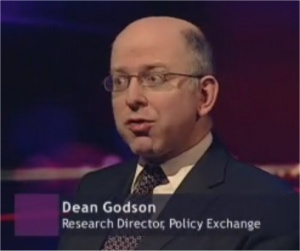 Dean Godson on Newsnight on 12 December 2007. Godson accused Newsnight editor Peter Barron of 'disastrous editorial misjudgement' and 'appalling stewardship'. On health policy, Policy Exchange says it is "committed to the values of the NHS in providing universal healthcare for all', although it believes that "private sector companies and third sector providers can play a key role in delivering what patients want from a modern National Health Service", ie not an NHS free at the point of need. Max Chambers, Senior Research Fellow - Health: Max Chambers joined Policy Exchange in February 2009. He is Senior Research Fellow, leading Policy Exchange’s Health and Social Care programme and contributing to the Crime and Justice Unit. Before joining Policy Exchange, Max worked as a researcher for the Shadow Justice and Home Affairs teams in Parliament, and was involved with a number of the Conservative Party’s crime and justice policy reviews. Henry Featherstone, ex-Head of Health and Social Care (dates tbc). In August 2010 Featherstone joined Fleishman-Hillard’s London healthcare public affairs and corporate communications team as a senior policy adviser. Prior to this Henry worked in the NHS as a junior doctor and also spent several years working in Parliament for a number of leading Conservative politicians, including Archie Norman, Francis Maude and Greg Clark. More recently he was chief of staff to James Arbuthnot MP, chairman of the Defence Select Committee. Incentivising Wellness: Improving the treatment of long-term conditions, by Henry Featherstone and Lilly Whitham, November 2010. This report claims that the NHS has proved to be bad at adopting new technologies "such as insulin pumps" that could cut costs radically and help keep patients with chronic conditions like diabetes healthier. According to the authors, "the best way of getting the NHS to adopt new technologies is to encourage new players to enter the health service." "Newly formed GP consortia of the sort envisaged by Andrew Lansley's White Paper, it claims, would be ideally-placed to pilot new business models which focus specifically on long-term condition management. The report was funded by Vodafone and MSD (Merck and Schering-Plough). Future Foundations: towards a new culture in the NHS, by Bill Moyes and Paul Corrigan, edited by Henry Featherstone, published 18 March 2010. Argues that centralised control by government undermines the autonomy of foundation trusts needed for change and innovation. The Cost of Cancer, by Henry Featherstone and Lilly Whitham, published 17 February 2010. This report highlights late diagnosis of cancer in the UK, poor survival rates for older people and those in deprived communities, and - again - the relatively poor take up of new treatments and technologies by the NHS. Report funded by Roche. Which Doctor? Putting patients in control of primary care, by Henry Featherstone and Carol Storey, with foreword by Julian Le Grand published 22 December 2009. This report proposes that the ban on the sale of goodwill attached to GPs - ie the value associated with the popularity of a GP practice - should be overturned. This would increase their value and lead to more private investors buying up and trading practices. Wilkinson and Pickett's book the Spirit Level was criticised in a series of reports by the Taxpayers' Alliance, the Democracy Institute and Policy Exchange. The criticisms from Policy Exchange and the Taxpayers' Alliance were published just 24 hours apart. Graph from the Charity Commission showing Policy Exchange's financial history. The Ideas Space, where Policy Exchange holds the majority of its events. In an undercover investigation conducted in June and July 2011, Bell Pottinger Public Affairs recommended a Policy Exchange event as a root to influencing UK government policy. The firm's managing director, Tim Collins, also recommended a meeting with its Chairman Daniel Finkelstein, who he said was very close to David Cameron. 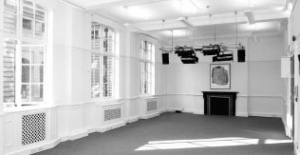 The majority of Policy Exchange's seminars, conferences, roundtables and debates are held at what it calls The Ideas Space - an events venue in Policy Exchange's HQ in Clutha House. In August 2006 Policy Exchange hosted a seminar the title of which was 'Why Are Britain's Universities Incubating Islamist Extremism?'. It was attended by right-wing figures including Anthony Glees, the author of When Students Turn to Terror; the Scottish academic Tom Gallagher; and the right-wing Irish historian Ruth Dudley Edwards. In an online article promoting the event  and at the seminar itself,  Tom Gallagher argued that a main cause of 'radicalisation' amongst young Muslims was not injustice, but that Muslim students are not intellectually capable of achieving in higher education. Are UK energy consumers getting a good deal? Amber Rudd MP, Simon Moore, Ian Peters and Professor George Yarrow. Building Britain: Are Garden Cities the key to delivering the growth and homes we need? Chaired by Rafael Behr, speakers: Richard Blakeway, David Cowans, Chris Walker and Dr Nigel Wilson. Why on earth does going to university cost so much money? Achieving financial sustainability in the English HE system. Chaired by John Gill, speakers: Margot James MP, Carl Lygo, Nick Ratcliffe and Jonathan Simons. Squaring the Circle: Can new infrastructure investment and NIMBYism co-exist? Chaired by James Kirkup, speakers: Nadhim Zahawi MP, Steve Hughes and Nigel Milton. City Living: What can the Conservatives do to win more urban seats? Chaired by Nick Faith, speakers Rt Hon Greg Clark MP, Richard Harrington MP, Michael Liebreich and Paul Uppal MP. New Champions: Unlocking the skills and growth potential of unexploited sectors in the UK economy. Chaired by Nick Faith, speakers: Nick Boles MP, Peter Gowers, Ufi Ibrahim, Dr Gerard Lyons and The Baroness Neville-Rolfe DBE CMG. Benefits Street: What more needs to be done to help people into work? Chaired by Allegra Statton, speakers: Mark Hoban MP, Steve Hughes and Deirdre Kelly. Markets for the Many? How the British public can share in the UK's financial markets. Chaired by Nick Faith, speakers: Jesse Norman MP, John McTernan and Xavier Rolet. What is the next stage of the Conservative's schools revolution? Chaired by: Alice Thomson, speakers: Rt Hon Nicky Morgan MP, Lucy Heller, James O'Shaughnessy and Jonathan Simons. Markets and Enterprise: Making the recovery work for the many. Chaired by Iain Martin, speakers: Rt Hon Elizabeth Truss MP, Steve Hughes, Senator Philip Ozouf and James Sproule. How can UK Plc innovate to help Britain win the global race? Chaired by Kamal Ahmed, speakers: Nadhim Zahawi MP, Gerard Grech, Steve Hughes and Adrian Letts. Fast and Furious: How can we make Britain a dynamic, fast growth, entrepreneurial economy? Chaired by James Quinn, speakers: David Gauke MP, Andrew Churchill and Ian Stewart. Five Million Points of Light: Getting Britain's small businesses finance ready. Chaired by Ian King, speakers: Matthew Hancock MP, Ed Conway, Steve Hughes, Fiona Laffan and Adam Whitehouse. Made in Britain: Skills, manufacturing and a modern enterprise policy. Speakers: Graham Stuart MP, Andrew McCall, Gavin Poole, Jonathan Simons and Alice Taylor. Build in my backyard: How can the UK get new energy infrastructure built? Chaired by James Quinn, speakers: Tim Yeo MP, Simon Moore, Ben Page, Matthew Pencharz and Gabe Winn. 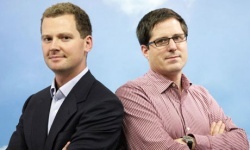 Open Data, Big Data and Privacy. Chaired by Eddie Copeland, speakers: Rt Hon David Willetts MP, Dominic Campbell, Heather Savory and Martin Tisné. September 2016: according to the Morning Star they 'staged a quite barmy rally against the so-called sugar tax' (paid by the British Soft Drinks Association). Can Britain ever build 300,000 homes a year? Chaired by Isabel Hardman, speakers: Roberta Blackman-Woods MP, Jeremy Greenwood, Shaun Spiers and Chris Walker. Fast and Furious: How can we make Britain a dynamic, fast growth, entrepreneurial economy? Chaired by James Quinn, speakers: Iain Wright, David Barnes and Steve Hughes. Will a price freeze destroy the energy market? Chaired by Damian Carrington, speakers: Rt Hon Caroline Flint MP, Peter Atherton, Simon Moore and Dr Michael Pollitt. Markets and Enterprise: Making the recovery work for the many. Chaired by Craig Woodhouse, speakers: The Baroness Hayter of Kentish Town, Senator Ian Gorst, Steve Hughes and Tom Mludzinski. Made in Britain: Skills, manufacturing and a modern enterprise policy. Chaired by: Afua Hirsch, speakers: Adrian Bailey MP, Simon Milner, Gavin Poole, Jonathan Simons and Andy Westwood. Why on earth does going to university cost so much money? Achieving financial sustainability in the English HE system. Chaired by Alex Bols, speakers: Rt Hon John Denham MP, Carl Lygo, Toni Pearce and Jonathan Simons. Five Million Points of Light: Getting Britain's small businesses finance ready. Chaired by Ian King. speakers: Ian Murray MP, Steve Hughes, Fiona Laffan and Gary Vizard. Parent Led Academies, Directors of School Standards and Collaboration for all: What should Labour promise on schools in 2015? Chaired by George Eaton, speakers: Tristram Hunt MP, John Blake, Chris Keates, Laura McInerney and Jonathan Simons. How can UK Plc innovate to help Britain win the global race? Rt Hon David Lammy MP, Steve Hughes, Adrian Letts and Maggie Philbin. Can Britain ever build 300,000 homes a year? Chaired by Isabel Hardman, speakers: Stephen Williams, Jeremy Greenwood, Neil Sinden and Chris Walker. Fast and Furious: How can we make Britain a dynamic, fast growth, entrepreneurial economy? Speakers: Jeremy Browne MP, Steve Hughes, Ian Steele and Mike Welch. How can UK Plc innovate to help Britain win the global race? Speakers: Jeremy Browne MP, Steve Hughes and Angela Maurer. ↑ Think Tank details, Stockholm Network, accessed 7 April 2009. ↑ Tim Montgomerie, 'Ed Miliband should learn from the Tory opposition experience', guardian.co.uk, 26 September 2011. ↑ PDF of <http://www.nickboles.com/about/meet-nick-boles> created 13 May 2010. ↑ Policy Exchange: Directors, Policy Exchange, accessed 19 October 2016. ↑ Policy Exchange: Research, Policy Exchange, accessed 19 October 2016. 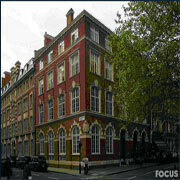 ↑ Policy Exchange, People: Natalie Evans, accessed 9 November 2010. ↑ The data displayed in this chart is based on the total number of events and publications as listed on the Policy Exchange website on 3 January 2011. ↑ The data displayed in this chart is based on the total number of events and publications as listed on the Policy Exchange website on 3 January 2011. The graph shows the think-tanks significant expansion since its launch in 2003. ↑ Screengrab of <http://www.policyexchange.org.uk/research_areas/foreign_policy_and_security.cgi> created 9 April 2010. ↑ The 2008 Financial Statements do not provide even this information as to what makes up the income reported as ‘Voluntary Income’ or ‘Activities for generating funds’, rather this has been deduced from a comparison with the figures given in the 2007 accounts. The figure on page 6 of the 2008 accounts for ‘Voluntary Income’ in the previous year is equal to the total income from donations and research sponsorship in the 2007 accounts. Similarly the figure given there for ‘Activities for generating funds’ is equal to the aggregate amount given in the 2007 accounts for business forum membership, the sale of reports and the share of research projects paid by Localis Research Ltd.
↑ Ruth Dudley-Edwards, ‘Fundamentalist Lessons to be learnt by Irish Academe', Sunday Independent (Ireland), 27 August 2006. ↑ Solomon Hughes, Obesity Warning: Fat Cats’ Pimps At Work, Morning Star, 14 October 2016. Accessed 17 October 2016. This page was last modified on 12 December 2016, at 15:29.